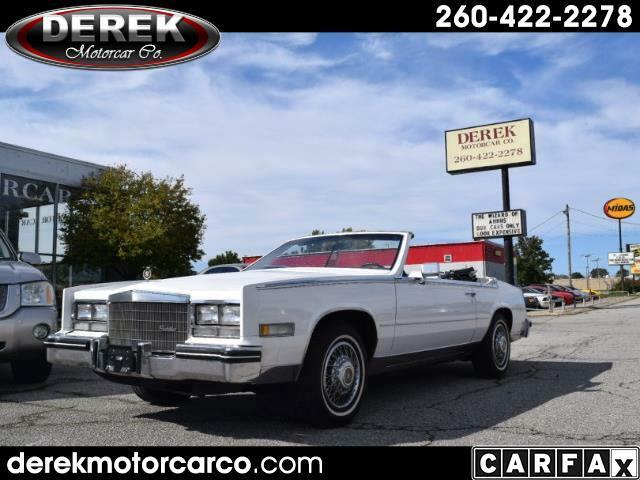 Used 1984 Cadillac Eldorado Biarritz for Sale in Fort Wayne IN 46805 Derek Motorcar Co. This car was purchased at a very elite collector car auction in 2014, and has been driven very little since. The car just received a major service, which includes oil change, transmission fluid change, valve cover gaskets, coolant change, and the a/c serviced. This is a nicely presented Cadillac Eldorado Convertible in an attractive color combination of White with a white soft-top and white leather interior, with blue carpet and dashboard with the desirable black trim with wood grain. This car, as with similar Eldorado models of the era, is loaded with luxury items that include Air/tilt, cruise, wire wheel covers, remote mirrors, am/fm/cassette, power seats, door locks, windows, top, steering and brakes. Call with any questions, or stop in today!